I am writing you this note to let you know that I still use Brave Hearts in my Criminal Investigation Class. It’s our 8th year using the book as a teaching tool. This is a picture of our current basic officer class of 154 students. Here they are reading and answering the questions for Chapter 2. 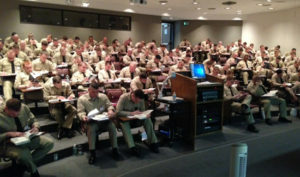 We train about 154 basic officers every 15 weeks. I saved enough books to supply the class from our our last shipment. The students check them out and then return them for the next class. To order your own copy of Brave Hearts click here.